Summary of today’s show: Monsignor James Moroney joins Scot Landry and Father Chris O’Connor for a liturgist’s perspective on the Season of Advent – how we can pray and wait in joyful hope for the birth of our Savior on the 25th of December. 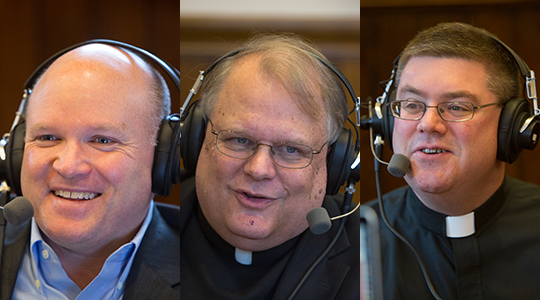 1st segment: Scot welcomed the listeners to the show, recorded at St John Seminary instead of our usual location in the Pastoral Center in Braintree. Today’s show will focus on the season of Advent, Scot said, which sometimes gets overlooked due to secular pressure and traditions. Msgr. Moroney agreed that Advent at the Seminary is a special thing, where men wait for the coming of Christ not only at Christmas but into their lives as well. Scot asked Msgr. Moroney what news there has been at the Seminary since he was last on over the summer. Msgr. Moroney commented that the Seminary opened this year completely full with no open rooms, a very positive sign for the future of the Archdiocese. He also said the Seminary has purchased Our Lady of Presentation church in Brighton just down the street from the Seminary to be used as an educational facility and lecture hall. Fr Chris also commented on the success of the visit of fifth graders from all over the Archdiocese in the month of October, and how touching it was for both the youth groups and the seminarians to visit, and how events like that truly enhance vocations in the Archdiocese. 2nd segment: Scot asked Msgr Moroney, who has been a liturgist for many years, how the season of Advent is intended to prepare us for the coming of Jesus. Msgr Moroney said there is a phrase that we use every day in Mass – “waiting in joyful hope.” This waiting is something we do every day, but should be doing more intensely during the Advent season. We think of the preparation for Christmas as a preparation for Christ’s birth in the manger, gatherings with family and friends, and cookies – but since the early Church, Catholics have held three comings of Jesus. The first was Jesus born in the manger in Bethlehem. The second is the one we look forward to when He comes at the end of time to judge the living and dead. The third coming is the coming of Christ into our hearts. When Christ is born into our hearts, Msgr Moroney concluded, we can understand the significance of the Incarnation and the purpose of Jesus’ coming again. Throughout the Advent liturgies, we shouldn’t focus on a cute baby in the manager, as much as that is an important entry into the mystery – we should not forget our longing for the Messiah to come and lead us home. Advent is building a manger in our hearts preparing for Jesus. Scot mentioned Isaiah as a prominent figure in the Old Testament who we hear from constantly during Advent. Msgr Moroney agreed, noting that Isaiah is read every Sunday of Advent during every Cycle of readings. Isaiah was waiting to be saved from the Diaspora, when the Babylonians exiled everyone from Jerusalem, to be led back home to Jerusalem. When we talk about waiting for Christ to come in glory, Monsignor said, we can relate to the longing of Israel to return to Jerusalem. Fr Chris mentioned that other figures who feature prominently are John the Baptist, Mary, and St Joseph, and asked Monsignor how those figures tie into the Advent season. He replied that an ancient painting in catacombs shows how tied to Mary the early Christians were – the prophet Balaam is shown pointing towards Mary, holding the infant Jesus in her arms. Monsignor also added that in most early depictions of the nativity, St Joseph is always falling asleep. This points to Joseph’s penchant for hearing God’s will through dreams. John the Baptist, Monsignor continued, figures heavily into Advent as the herald of the coming of the Christ – the one who prepares the way. We should join John the Baptist in preparing the way for Jesus in our hearts and all aspects of our lives. “Grant your faithful, we pray, almighty God, the resolve to run forth to meet your Christ with righteous deeds at his coming, so that, gathered at his right hand, they may be worthy to possess the heavenly kingdom”. Monsignor Moroney told a story about having a gold star on a composition when he was younger, and the pride he had when he showed his mother and father his work. This is what we are experiencing when Jesus comes – we have the opportunity to show our good works to Him. This prayer says, Monsignor concluded, that we should all work to be ready to pick up in our arms every good thing, sacrifice, and prayer to run out in confidence to Jesus when he comes again. Scot asked Msgr Moroney what the “joyful hope” of Advent means. Msgr Moroney said that our joyful hope should be different than the emotional hope we feel, like when we get a scratch off a ticket and hope all the way to that last number being uncovered. Rather, our hope should be “sure and certain,” the promise that Christ has given us that if we die with Him, we will rise with Him. The joyful hope that Advent and our whole lives are about is that Jesus has saved us. Fr Chris asked what the liturgical cues we should see at Mass are for Advent. Msgr Moroney replied that a very obvious one is the Advent wreath – some evergreens with a candle to be lit for each Sunday. The symbolism of the evergreen is important, he continued, that the branches stay green even after all the other trees have lost all their leaves, as Christ is the one promise of life even during the worst winters of our spiritual life. Another cue is the different vestment colors, to purple and rose. Purple was chosen as a penitential reminder, but also (according to St Ambrose) for the color on the horizon that appears just before sunrise – a preparatory purple that disappears once the light has appeared. In the same way, we are preparing with purple until the light of Christ comes on Christmas. Scot mentioned that the third Sunday of Advent is different – rose, not pink! Msgr Moroney said it is an intensification of the purple color, showing our approaching readiness. Fr Chris asked why we abstain from singing the Gloria during Advent. Monsignor Moroney said we “fast” from the Gloria so we appreciate it more when we go back to it on Christmas. 3rd segment: Scot asked Msgr Moroney about some of the hymns that we sing during Advent, and the lessons they can teach. Msgr Moroney said there is one hymn that almost every Church sings, O Come, O Come Emmanuel. The word “Emmanuel” is a scriptural term meaning “the God who is with us.” One of the biggest problems people have with faith and Church today, Monsignor continued, is appreciating that God is indeed with us. Too many of us get stuck in a routine or a rut without God until a crisis happens in life, and then we go looking for God – most of the time, we take the presence of God in our lives so much for granted that we assume He will always be there with us.